A reporter attended from a daily Mandarin-language newspaper called The China Press. He was so impressed by the skill and focus of the BASIS Independent students in the room that he asked to visit the Brooklyn campus for a separate article about the teaching methods used by the Mandarin faculty at the school. 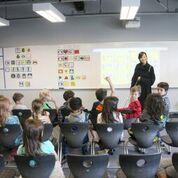 BASIS Independent schools teach Mandarin starting as early as Kindergarten to help students learn a new syntax, which also helps them better understand the various parts of languages and how these parts related to each other. Foreign language acquisition has been shown to improve critical thinking, increase creativity and simulate learning in many different subject areas. 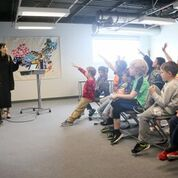 Mandarin class at BASIS Independent integrates language development with the study of Chinese culture and history, allowing students to appreciate other cultures in addition to their own. Read below for a translation of the original The China Press article. The first BASIS charter school was founded in Tucson in 1998 by Michael Block, Ph.D. and Olga Block. They decided to open a school that would educate students at an internationally competitive level and that combined the Asian and European academic standards with the creativity and ingenuity that is often found in the American classroom. Since the first school opened in Tucson, BASIS.ed has managed a unique, high-achieving, and unprecedented network of schools — five independent schools (located in Brooklyn, Manhattan, McLean, San Jose and Fremont) and an international school in Shenzhen, China, as well as 18 charter schools across the United States. BASIS Independent Brooklyn opened in 2014, and with the Brooklyn campus fully operational it has been growing fast. The school has attracted many parents, and some even moved here from out of state in order to bring their children into the school. BASIS Independent Brooklyn already has 400 students from K to 12 and more than 40 teachers. The number of students is expected to eventually be expanded to close to 800. Like other BASIS.ed schools, BASIS Independent Brooklyn offers Mandarin Chinese from Kindergarten onwards. The unique curriculum at BASIS Independent Brooklyn has attracted more students over the past year, and there are now four Mandarin teachers, Na Fan, Ran Xu, Alex Chen, and Kafele Kossally. At the Brooklyn location, students learn Mandarin with visual cues and songs. Students from every grade are happy to learn Mandarin and become conversational after one year of learning. The school also has a popular Chinese choir club in which students study and sing Chinese songs. BASIS Independent Schools have a strong liberal arts and science and engineering focused curriculum. Students take biology, chemistry and physics courses beginning in sixth grade, and a minimum of AP courses in high school. The school's tuition is lower than other private schools. Students’ average annual tuition is around $25,000. BASIS Independent Schools plans to open another campus in New York City. BASIS Independent Manhattan, a K-8 school, opens fall 2017 on Manhattan’s Upper West Side. Students at BASIS.ed managed schools outscore students around the world – including Shanghai, the top scoring educational system - on the OECD Test for Schools / Programme for International Student Assessment (PISA). Among 2015 graduates, 94% were accepted to a university ranked in the top 100 by the QS World University Rankings and 63% were accepted to a college or university ranked in the top 100 by US News & World Report. Learn more about BASIS independent Brooklyn and the other schools around the country by visiting their website at basisindependent.com. Join us at an upcoming event to see for yourself what all the buzz is about!